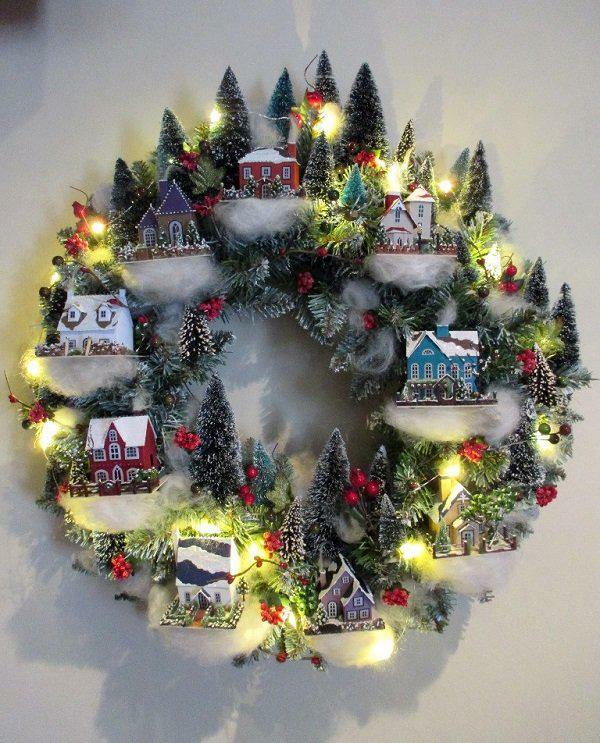 Beautiful Christmas village wreath. This is truly a very unique Christmas wreath that you can do because you can find more than leaves and flowers on it, but an entire miniature village. Once again it’s Christmas! It’s this time of the year that many people have been waiting for not only because it is the last event of the year, but because Christmas is one of the most special occasions for everyone around the world. This is also the season where so many people are looking forward to and is one of the longest holidays of the year. People even plan for their Christmas holidays eve in the early parts of the year and they reserve tickets to travel back to their hometowns or to go o out of the country trips. Christmas wreaths are probably one of the most recognizable symbols of the Christmas season and it is a very popular decoration used by any and is traditionally hung at the door. Wreaths are used as a welcoming decoration and they even have Advent counterparts in Christian religion. Before, it was also hung up on lamp posts within the cities and so many more. Even though wreathes have been used before, they have continued to survive until now in modern society and they come in various styles and are also made out of various materials to become more durable. The Christmas season isn’t complete nowadays if you don’t see wreaths that decorate the doors. What makes it better is that wreaths have had a long history behind them that spans in many different cultures and in religion as well. They’re just not pieces of decoration that you hang on the doors and the wall and they also have a deeper meaning in them. Traditionally, in Pagan culture wreaths are used to celebrate the Winter Solstice which is also the shortest day throughout the year. For the Pagan culture, this is the time of death an also a time of rebirth. This means that its going be the end of the shorter days and the rebirth of longer days throughout the year. Thus, evergreen wreaths are collected to appreciate the arrival of spring. In other countries like Sweden, wreaths are also created but with candles that are used to symbolize the sun. The tradition of using wreaths for Christmas and advent have been passed down even to the new generation. Starting with the circle shape of wreaths that symbolize eternity and has no beginning and end, this can also mean everlasting life or infinity. Nowadays it isn’t only leaves that are used to create wreaths, there are commercial wreaths being made out of plastic in order to create the perfect shape and last longer than traditional wreaths. This means that the Christmas wreaths that you have bought last year can still be used especially when you’re saving on decorations. The kind of leaves that you use to make your Christmas wreath also varies, if you’re going for the all natural look. Holly is the one which represents immortality while cedar represents strength. Basically a Christmas wreath specifically is a sign of welcome and also a way to celebrate the coming Christmas holiday. Christmas itself represents giving, generosity, loving the family and gathering loved ones which also means hanging the Christmas wreaths signifies that you are acknowledging the welcoming feelings that the Christmas air is giving off. 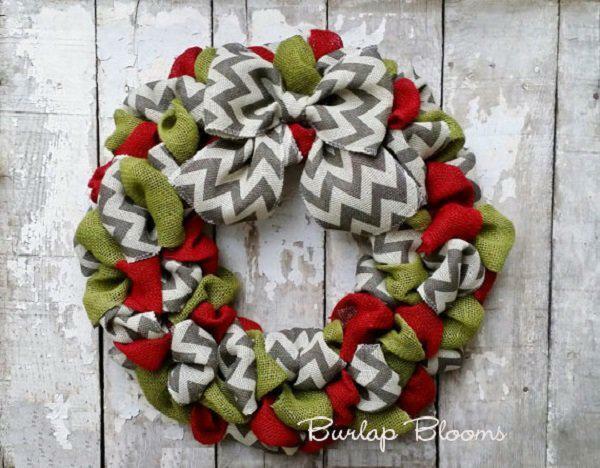 If you don’t feel like buying commercial wreaths you can always make one for your home. You don’t have to worry because it’s not that hard to make your own wreath for Christmas. What you have to do would be to collect the materials needed to making a wreath. Try to collect the materials on a container that is filled with floral wire, glue as well as gloves to keep your hands safe when you’re using the hot glue to piece things together. This can also help when you are dealing with hot glue and glue guns. It’s best to use wire frames for wreaths since they are very versatile. They also come in various shapes and they are durable enough to stand as wreaths. They are able to handle leaves and even citrus fruits and evergreen boughs. You should use a single wire frame that is thin and delicate, perfect for a simple wreath, if you want a lush looking wreath then you can use a double wire frame. You can then attach a floral wire on a paddle towards the crossbar of the double wire. You can also use a Noble fir or other evergreen cuttings for the double wire wreath. Simply put a small group of greenery on the wire that you have formed. Wrap the wire around the stems around three times. don’t simply cut the wire, just add another bundle as it overlaps the previous one. Wrap them around the stems and continue with the bundle until you come back to the point you have started. Secure the end of the wire with a knot and tuck it under the form you have shaped. If the whole form is covered then you can tie off the wire and leave a few extra inches on the end before you cut it. If yo want a hanger on the wreath, for the end of the wire into a loop shape and twist it around. 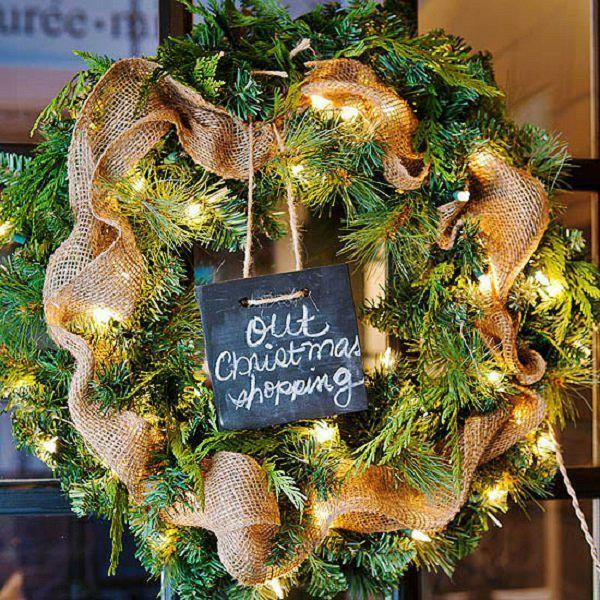 Whatever your Christmas wreath will be, what’s important is that it represents your feeling for the Christmas season. You can also use this as a means to bond with your family by creating Christmas wreaths and at the same time decorating the Christmas tree and the entire house to make it more welcoming. 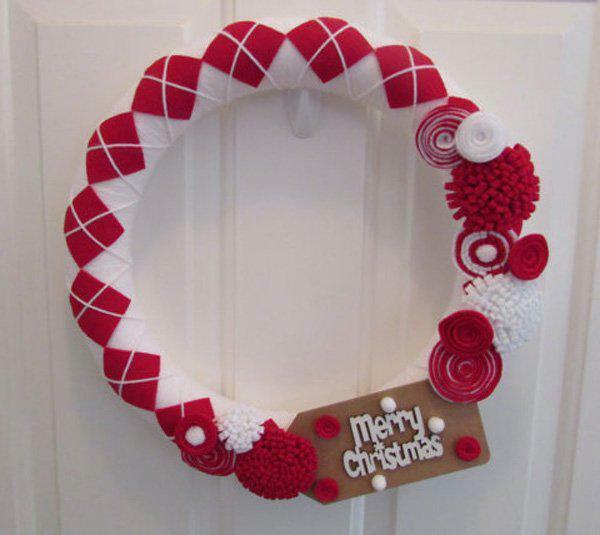 Yummy looking candy cane Christmas wreath. A very creative and modern Christmas wreath that consists of slices of candy canes. The wreath looks vibrant and light which makes it really unique from common Christmas wreaths out there. Wonderful looking wooden Christmas wreath. The ingenuity of the design simply stands out as the wooden effect makes the wreath look even more welcoming and artistic. Greenery inspired Christmas wreath. The lush green colors on the wreath gives it a very fresh vibe that you simply would love to look at it. The flowers and the red berries also add as accent to the design. 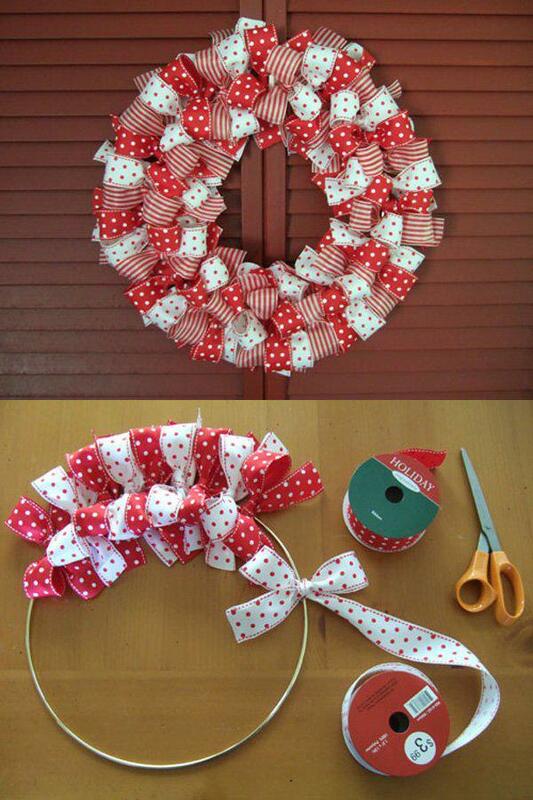 Very pretty ribbon themed Christmas wreath. When it comes to Christmas, you are always wrapping gifts and you can use the extra ribbons to make a very unique wreath without having to but other materials. 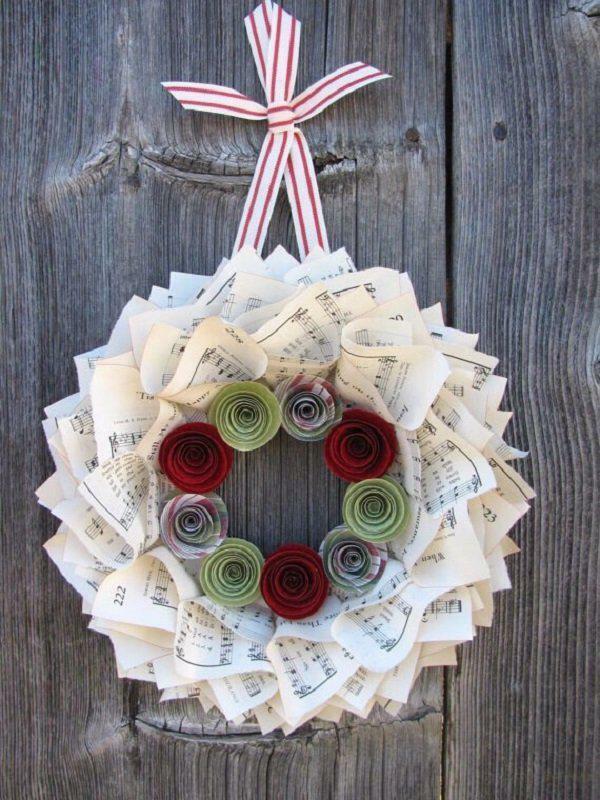 Beautiful musical sheet inspired Christmas wreath. The wreath is composed of musical sheets and colored paper designed to look like a rose. It looks simple and yet is very meaningful. 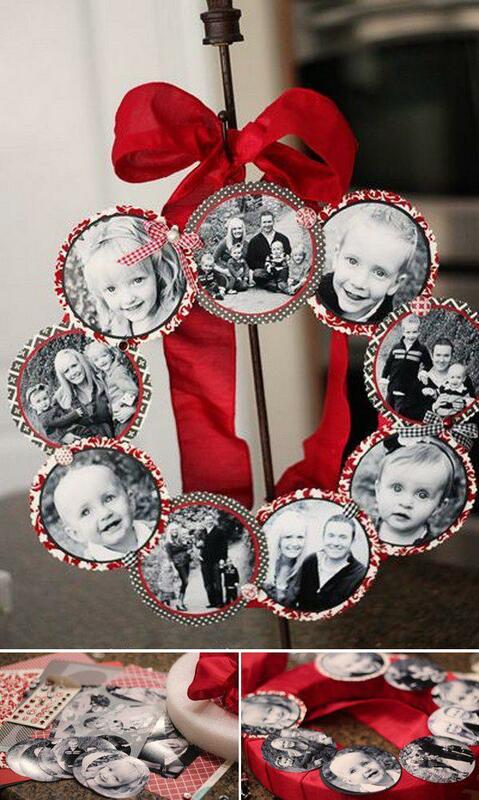 Portrait themed Christmas wreath. When you want to value your family this Christmas then you can always substitute the regular greenery on Christmas wreaths of photos of your family and loved ones. Frog tape leaf decorated Christmas wreath. It is a very cute and creative Christmas wreath as you cut out small leaves in order to form the wreath itself. 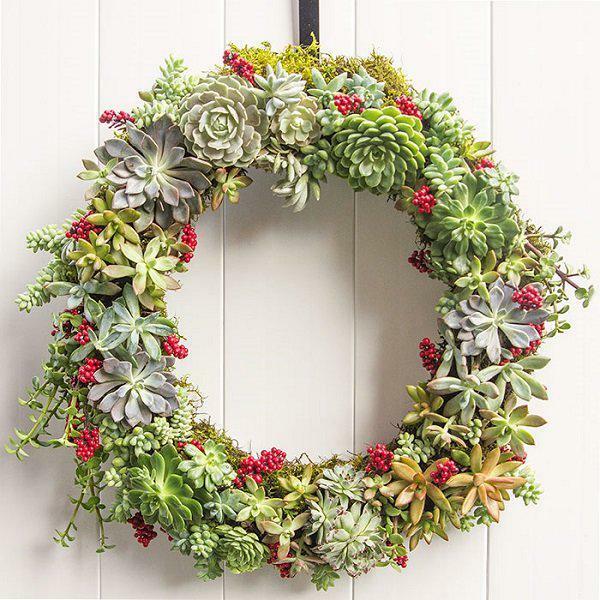 When combined together it looks like a realistic wreath filled with fresh leaves. 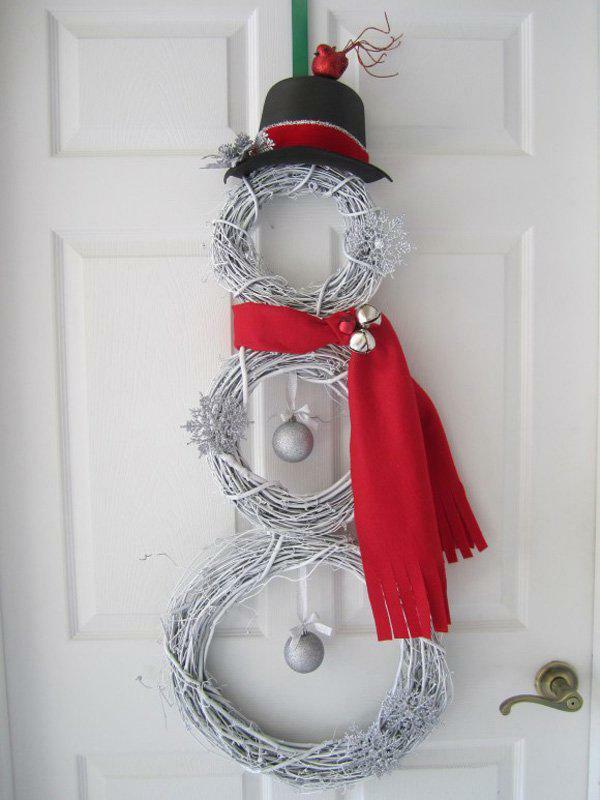 Snowman inspired Christmas wreath. When you make wreaths it doesn’t mean you can only use one grape vine loop. You can be creative and form three loops to complete a snowman and add accent on it like the hat and the scarf. Ribbon and bell inspired Christmas wreath. The wreath is looped with red ribbon to symbolize Christmas and bells are hung in the middle to create tinkling sounds whenever you open the front door. Star shaped Christmas wreaths. 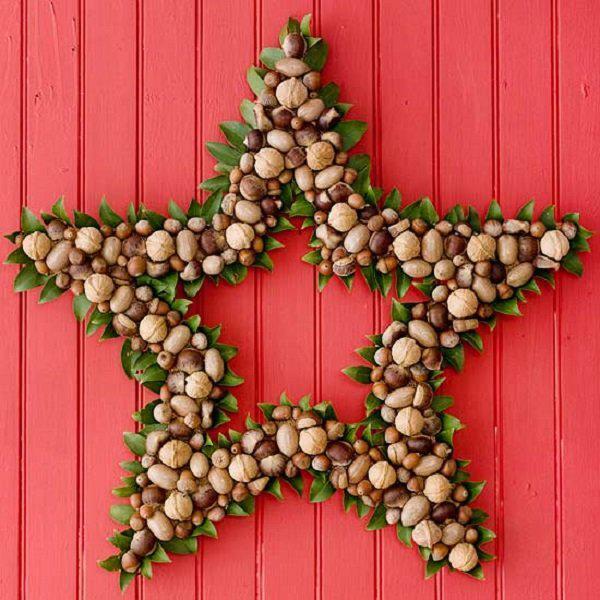 If you want to be different with your Christmas wreath you can design them in this shape and fill it with chestnuts inside and framing them with green leaves to complement the chestnuts. 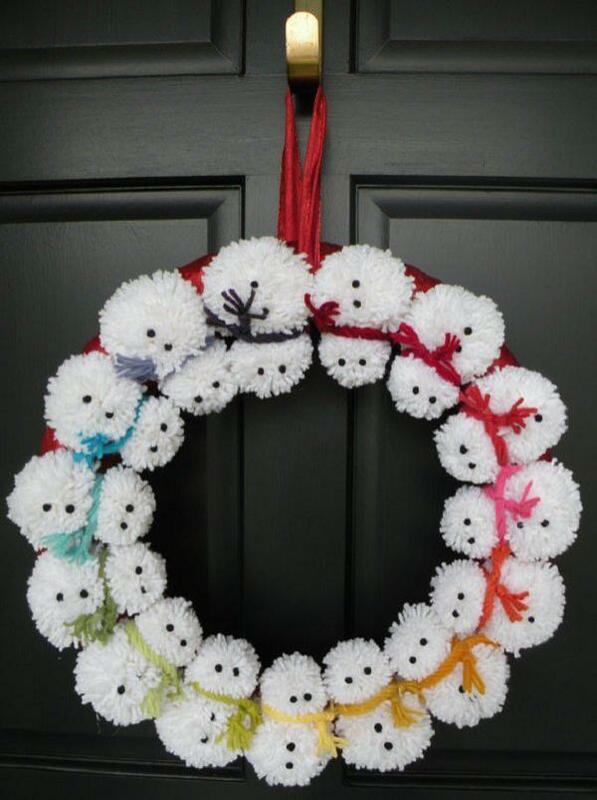 Very cute pompom snowman inspired Christmas wreath. You can try this wonderful looking design and compile together miniature snowmen and form them into a loop to create an endearing looking winter wreath. Lovely looking Christmas wreath with PVC pipes and Christmas balls. 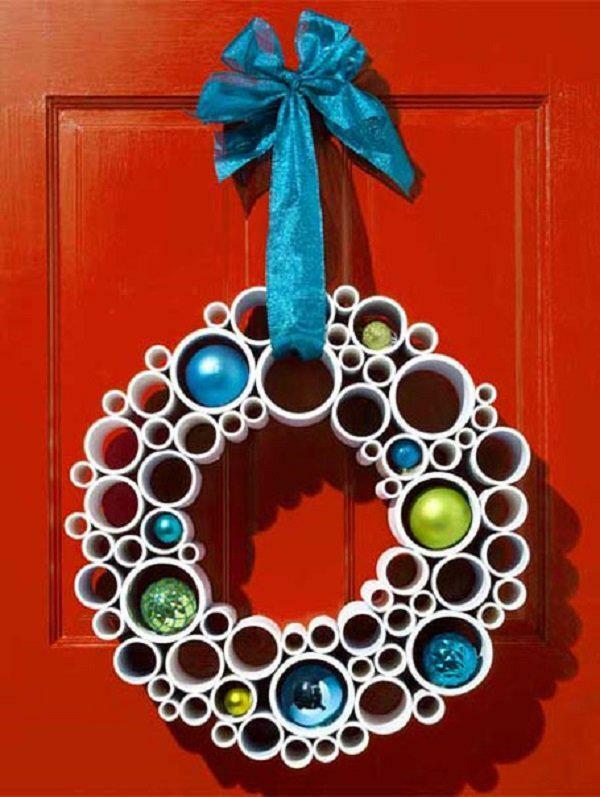 Christmas balls aren’t only hung on trees as you can also hang them in Christmas wreaths now in well cut out PVC pipes. Orange and yellow berry themed Christmas wreath. The warm and inviting colors of the berries give life to the wreath and makes it look very lovely and welcoming. Another cute and warm ribbon inspired Christmas wreath. This combination looks very adorable and simply fits just about any Christmas theme decor you have at home. 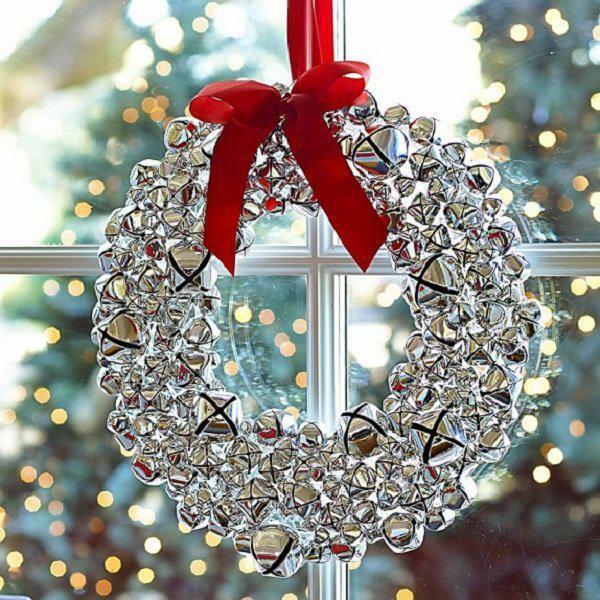 Wonderful looking Christmas wreath in silver and gold color combination. The all natural colors on this wreath blend well together thus making it look pleasant in the eyes and perfect for just about any home decor. Beautiful graphics and musical sheet Christmas wreath. It looks very simple but when you look at the design it is very unique. If you love fairies and music then you will definitely love this concept. 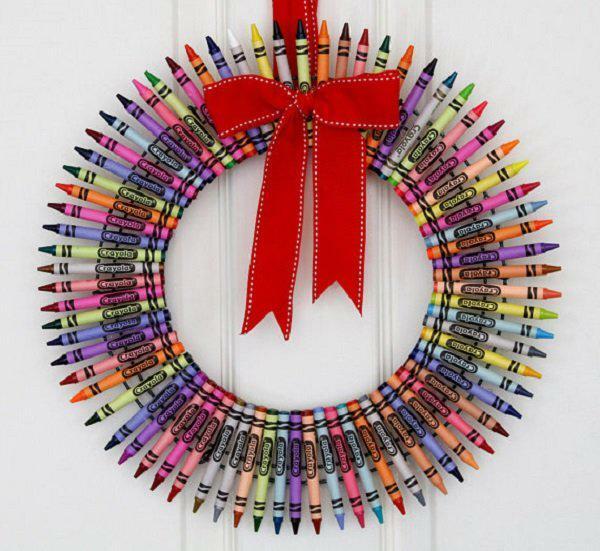 Crayon Christmas wreath. This is one of the most unique and funny looking wreaths. It helps make use of a variety of colors and at the same time saves you from buying any other expensive materials for your wreath because you can now use your old crayons. Pine cone and cherry inspired Christmas wreath. This is one of the perfect combinations when it comes to Christmas wreaths because of how the colors and the materials blend well together. Silver bells Christmas wreaths. The wreath looks very fresh and elegant with the silver and white color combination and the bright red ribbon accents simply helps make the wreath stand out. Wonderful looking white Styrofoam balls as a Christmas wreath. The pure white color of the wreath helps symbolize the genuine purity of the design. A red ribbon accent is added on top to make it look even better. Amazing striped paper straw Christmas wreath. The red and white color combination is perfect for the Christmas season and the shape of the paper straw also blends well with the shape of the wreath. Toilet roll inspired Christmas wreath. If you don’t want to spend so much when you’re on your Christmas budget you can always use the things that are in your home like toilet paper rolls. This is economic and you can save more to buy presents for your love ones. 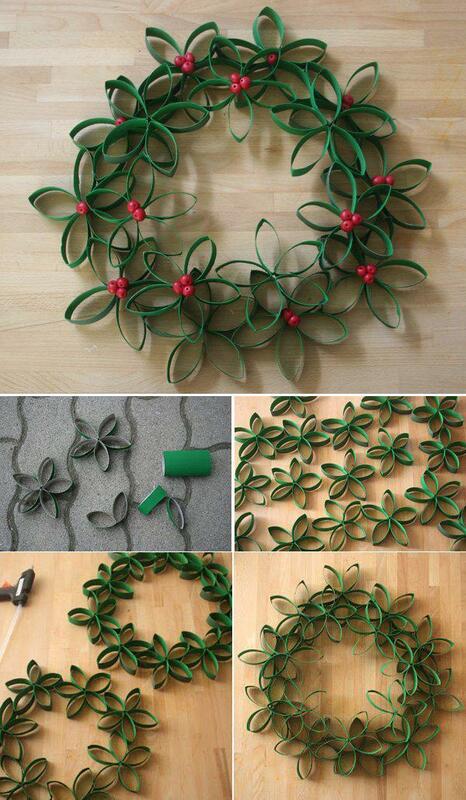 Creative looking Christmas wreath using simple materials. All you need are small materials that you can find at home, simple touch ups and combination of decorations can simply make any design stand out. Christmas wreath made out of Christmas ornaments. You don’t simply hang Christmas ornaments on Christmas trees because you can also make use of them to make your own unique version of wreaths. Beautiful pine cone Christmas wreath. 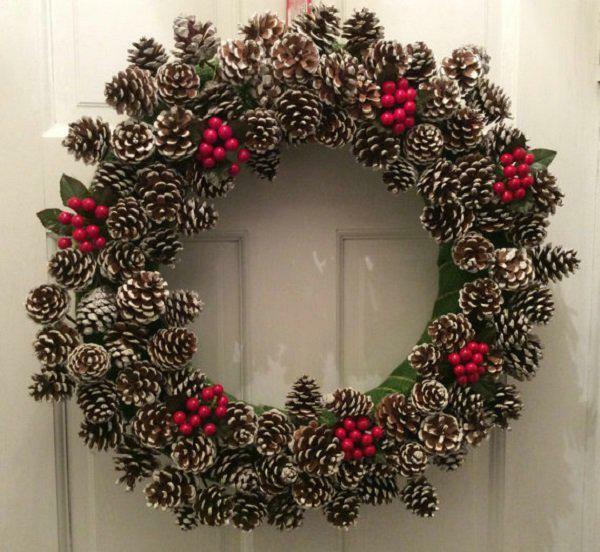 Make use of the abundance of pine cones in the Christmas season and make them into beautiful wreaths just like this. 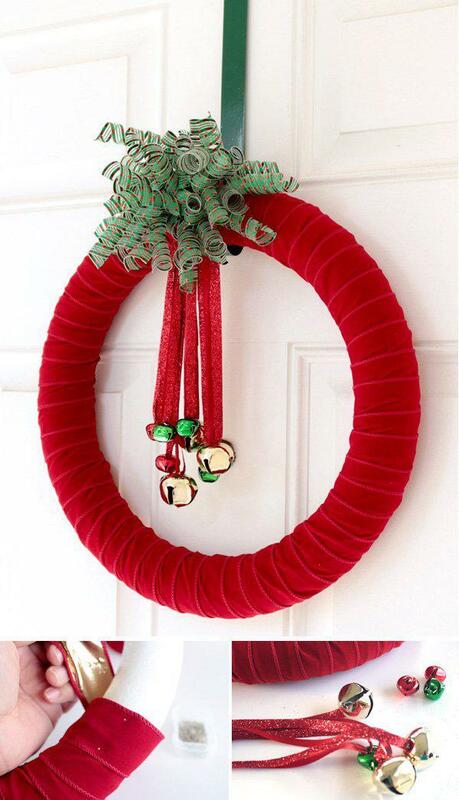 Delicious looking candy cane Christmas wreath. 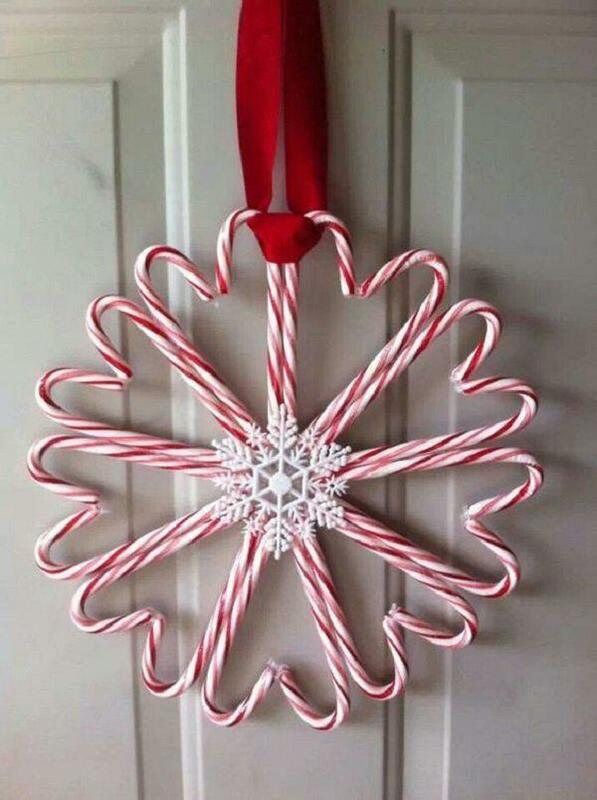 It’s a very simple design of candy canes grouped together with a snowflake in the middle. It looks perfect with symmetry on its own. 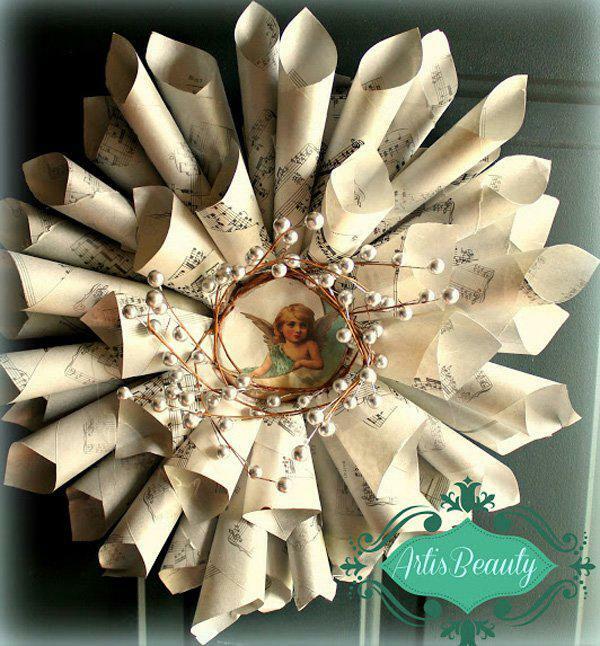 Very creative card holder Christmas wreath. 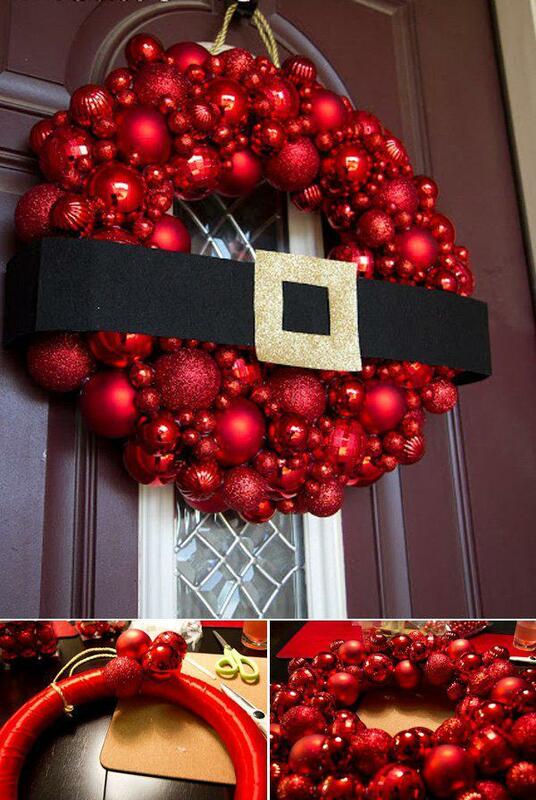 You can make use of card holders and form them into fun looking Christmas wreaths for your house decor. They’re easy to find and very simple to make into a wreath. Beautiful white and red Christmas wreath. 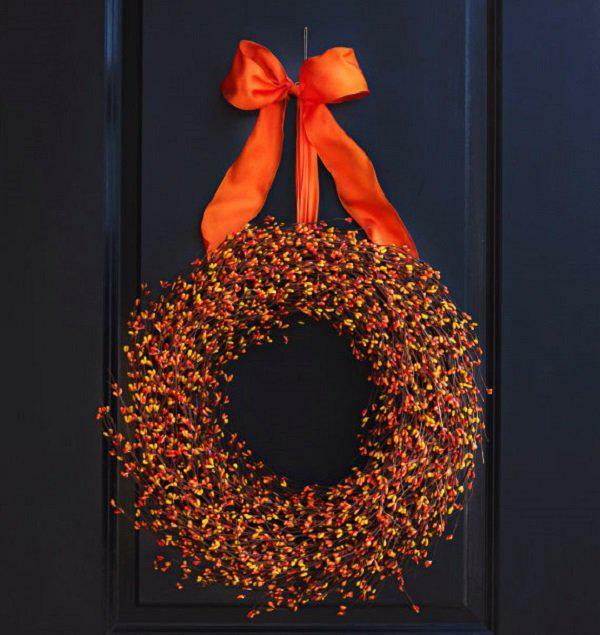 This simple yet fabulous looking wreath design is perfect for just any house where you can hang and admire it. Festive looking Christmas wreath in green and gold color combination. The lush greenery added to the wreath plus golden ribbons make it look majestic and elegant. 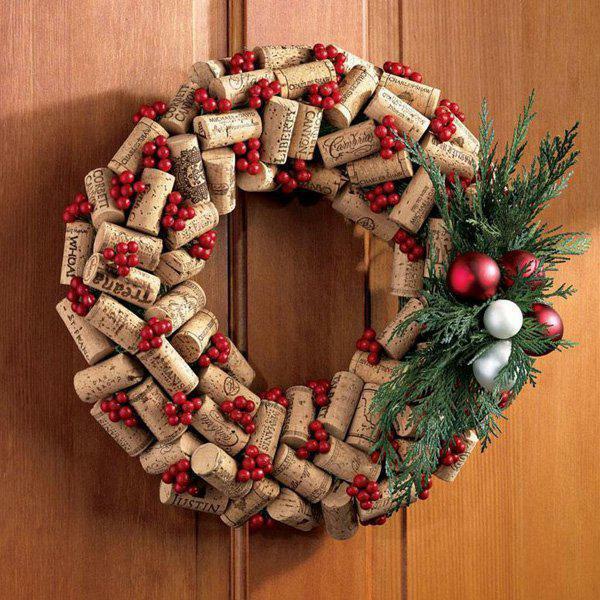 Beautiful cork Christmas wreath. 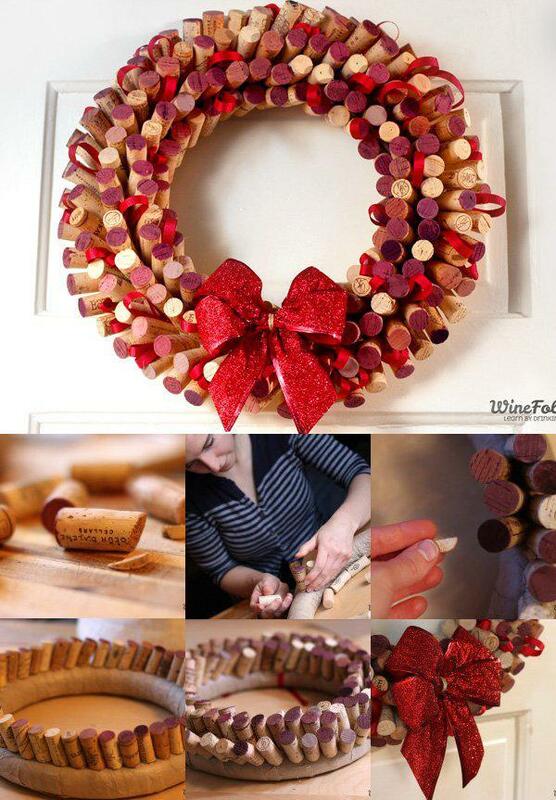 don’t throw away your wine corks and make use of them with this wonderful Christmas wreath idea. Amazing Christmas wreath filled with ornaments. The Christmas wreath is then formed with a belt signifying the belt of Santa Clause, which is a wonderful accent to the design.